having had such success with the cabbage, thyme and mozzarella pasta dish i made last week to use up some of my excess cabbage purchase i decided to try another cabbage and pasta recipe and called on dennis cotter for inspiration. this dish is a little more austere than the previous one and having made it twice, once with a pointed cabbage and once with a savoy cabbage, i think it’s important to use a cabbage with as much flavour as you can find (the pointed cabbage was not great, dennis calls for the use of an abyssinian cabbage but i’ve not managed to track that down yet) and don’t skimp on the chilli, sundried tomatoes, cheese and pine nuts, all of which add interest. i’m sharing this recipe with aquadazed from served with love, who is this week’s host for presto pasta nights. meanwhile, heat the oil in a large pan and fry the shallots, garlic and onion until the onion has softened. stirring occasionally. 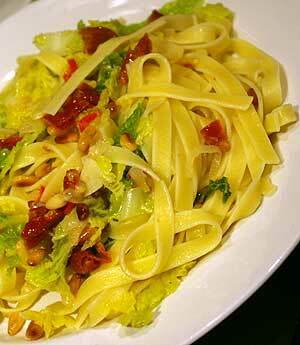 when the cabbage is nearly cooked, stir in the tomatoes, pine nuts, lemon zest, parmesan and plenty of seasoning. add the pasta plus a few tablespoons of the cooking water then toss together to mix everything. serve with more parmesan.